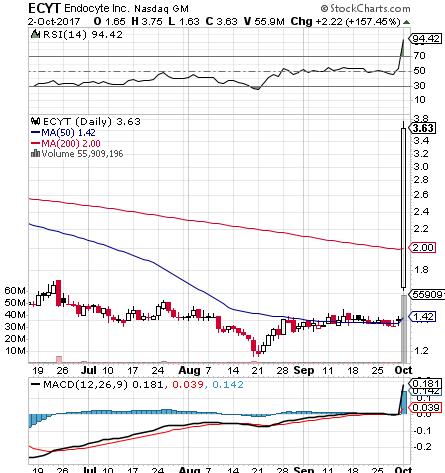 We took notice of ECYT yesterday morning during our routine premarket scan, and due to some abnormal activity, we decided to include it in the daily watchlist. Speaking of solidly-timed calls on pharma plays, we also caught RIGL and included it in yesterday’s premarket report. It didn’t see the type of move that the previously mentioned stock, but got off to a respectable start. RIGL traded in a range from 2.85-3.42, a modest rise of 20%, but did so on nearly 17X the monthly average volume, and closed near its high of day. We’ll continue to observe this play to see if it can establish a sustained uptrend. We were just updating our readers yesterday morning on the moves CAPR had made since we had alerted it onSeptember 20th from its low of 1.80. What followed was another nice session for the stock, which ran to a new high of 4.25; a total increase of 136% in a span of just eight trading days. We also want to quickly update readers on our TIF options ideas that we submitted on the morning of September 28th, the TIF 10/20 $92-93 Calls. The stock has been in a continuous bullish pattern since then, and those calls made some pretty nice gains in the process. $92.50 Calls – Range: .85-1.74 – Max Gain: 105%. The big winner off our premarket watchlist in yesterday’s report turned out to be ALQA, which had a hard spike early in the session and continued to push more steadily upward over the course of the day leading to a strong close. The activity was fueled by the news that the FDA granted 510(k) clearance for ALQA’a SilverSeal Hydrogel wound dressing. From its early low of .258 the stock traversed its way up to .45, which goes down as a 74% intraday gain. The move came on nearly forty times the monthly average volume on the stock, and as we just mentioned, it also closed with strength, just a penny below the high of day. After hours trading also saw the stock achieve a high of .51, and it appears as if it could gap up slightly to start the day. We’ll be on the lookout for signs of a continued uptrend here as we head into this midweek. Despite looming bankruptcy proceedings for UNXL, our bottom-feeder instincts have kicked in as the stock was punished down to a new all-time lows yesterday and is showing signs of a possible rebound this morning. This NASDAQ could certainly be on its way to an OTC Markets listing in the future, being nowhere near the minimum bid requirements for the higher exchange. But for the time being, we’re only interested in its immediate situation. Over-abused stocks have had a historical tendency to produce some very nice moves for us as they correct course, so we’re going to place UNXL on watch in coming days. We also wanted to swing back around for a quick update on RMRK this morning. We placed this one on watch last Wednesday morning, catching it before it ran over 300% from .0006-.0025 that afternoon. After a sharp pullback to .0008 over the ensuing few sessions, the stock rebounded yesterday, returning to a high of .0019 which marks a 138% swing. We’ll be watching for it to continue to register higher lows on any further pullbacks. Any stock with this kind of price action and volatility is one that we definitely want to keep a close eye on for more quick strike trade opportunities. We placed a number of options ideas on watch yesterday, and PRGO produced the biggest gainer of the day, even as the markets as a whole continued to be in distress. Despite posting a loss, the company’s earnings beat expectations and after a huge gap-up to start the day, the stock traded with sufficient intraday volatility to provide a nice opportunity for single-session profits in the PRGO Weekly $75 Calls. Those contracts traded in a range from a low of .15 up to an impressive high of 2.50, marking an enormous 1566% rip on the day. We’re seeing NVIDIA taking a hit in the premarket this morning, even as it just received a price target upgrade from analysts on the heel of its own earnings report. We see the possibility of a rebound for NVDA stock leading to some nice activity for the NVDA 09/01 $155 and $157.50′s Calls , so those are the contracts we’ll place on watch today. We’re looking at CMLS as a possible momentum play. The stock has been building up quite a head of steam over the past few sessions, trading an inordinately high amount of volume yesterday. Since hitting its lows toward the end of last month the stock has been in a general uptrend. Every time it has receded, it has rebounded back to set new highs. We’ll place CMLS on watch to see if it can maintain the powerful trend it has established. CMLS is gapping up in the premarket this morning. On any pullbacks, we’ll want to see CMLS maintain support at a minimum of .50 in order to maintain our immediate interest. 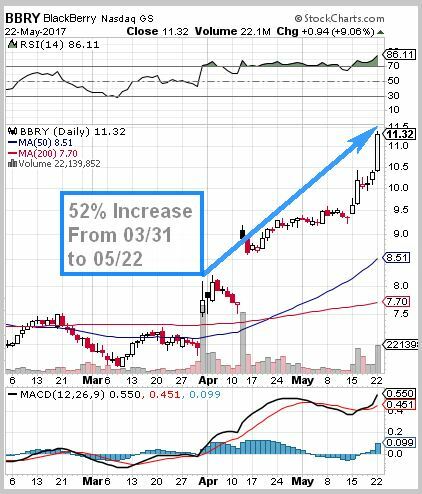 Normally, when we alert on a big board play without including some type of options idea, as we did with BBRY back on March 31st (and April 12th), it’s because we feel the stock itself is generally undervalued. Where BlackBerry is concerned, we have thus far turned out to be right on the money. We saw a low of 7.47 on the morning of March 31st, and BBRY hasn’t looked back since. In its largest single session move of the year, the stock hit 11.38 yesterday. That represents an increase of 52% over our observed low, as we’ve pointed out on the chart below. .
FerroGlobe PLC (GSM) – Along the same lines, we highlighted GSM yesterday, a stock which is priced similarly to BBRY. It managed a slight increase after gapping up, and we’re going to continue watching this one as well.